**Many thanks to NetGalley, Oneworld Publications, and the author for the opportunity to read a free ARC of this book in exchange for my honest review. I can tell you most sincerely sir, I’ve had enough of Death today. Yes! I finally found a book that is perfect for the Halloween season! It also fits into my October Spooky Reads challenge! The Strange Casebook is a collection of six short stories – each of them with eerily creepy aspects that fit right into dark rooms with low fires and creaky doors. Remember those camping trips you took when you sat around the fire and tried to out-scare each other with the most gruesome or most bizarre tales of specters and ghouls? Any one of these stories would win hands down. Yes, the screaming. I do apologise. The medication has calmed her now. She’ll not disturb us again. Enjoy these six short spooktacular stories, inspired by Rosie Strange and Sam Stone’s work at the museum…if you dare! These stories focus on characters that interact with Rosie and Sam in the Essex Witch Museum series and take place across a number of different time frames. Whether it be Rosie’s old relatives, academic George Chin or the residents of Adders Fork – spooky incidents abound at every turn. The House on Savage Lane: Twins are always part of the creepiest stories! I find myself alert to slipping ghouls, dark-backed creatures, shadows unpeeling from crevices and walls. I enjoyed “Snowy” and “She Saw Three Ships” the best, but each of them has its own brand of oddity that makes for freakily atmospheric reading. Not a fast reader? No prob there either – these are short stories, remember? and you can stretch them out too; read one each night and you’re still done in less than a week. Once we’d had her cleaned up she looked almost human. 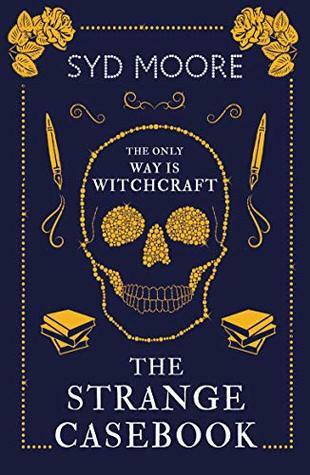 These short stories exist as part of the Essex Witch Museum series which also includes Strange Magic, Strange Sight, and Strange Fascination. Strange Tombs will release in 2019. But before Strange Tombs, get your hands on The Strange Casebook which releases on October 31st. Yes, Halloween! Told ya, perfect! Syd Moore was a lecturer and a presenter on Pulp, the Channel 4 books program before becoming a writer. She is the author of the mystery novels The Drowning Pool and Witch Hunt.